Say Hello to The Greeks! To learn more about options, check out this module on Varsity. Why are the Option Greeks important? What do you think makes a bollywood movie successful at the box office? Chances are you’d say – the success of the movie depends on the lead actors. Well, this is true to some extent. But in reality the success heavily depends on few other variables such as – the story line, the director, the songs, the dance, cinematography, and the works. Drawing parallels, what according to you is required for a successful options trade? Chances are you’d say the success depends on which direction the market moves. Well, this is true to some extent, however this is equivalent to saying the movie’s success depends on just the lead actors. In reality, besides the direction of the market, the success of an option trade depends on.. These variables which influence the option trade are called ‘The Option Greeks’. The delta, a constantly varying number, is a measure of how an option’s value changes with respect to change in the price of the underlying contract. In simpler terms, delta helps you answer the question “By how much will the option’s premium change for every 1 point change in the underlying price”. For example, assume you buy 7,800 Call option when Nifty is at 7,775. After you buy the option, assume the market moves by 25 points, and hits 7,800. For the 25 point move in the market, by how many points will the option premium increase from Rs.48? The answer to this lies with the delta. The call option delta is a number which ranges between 0 and 1. For instance, an option has a delta of 0.4, then for every 1 point change in the underlying price, we can expect the premium to vary by 0.4 point. In the initial example, assuming 7,800 call option has a delta of 0.5, for a 25 point move in Nifty (underlying), the premium is likely to change by 12.5 points (0.5 x 25), hence the premium is expected to goto 60.5 (48 +12.5) from 48. Put options have characteristics similar to call options, except that they move in the opposite direction of the underlying market. When the underlying gains, put premium goes down and vice versa. Hence put options’ delta ranges for -1 to 0. Meaning if the put option has a delta of -0.5, then for every 1 point up/down move in the market the put premium loses/gain 0.5 points. For example, assume the 7,700 Nifty put option is trading at 30 when the underlying i.e Nifty spot is trading at 7800. Also assume the delta for this option as -0.3. If the market were to move to 7830 from 7800, the premium is likely to change by – 9 (-0.3 x 30) points. Hence the new premium will be -9 + 30 = 21. You can use the following table to approximately guess the delta of an option. Needless to say, the exact values can be determined by using an options calculator, however use this table to intelligently estimate the delta on the following. Assume you buy TCS 2,600 put option when the underlying trading at 2,550. You immediately recognize that the 2600 put option is ‘In the money’; hence as per the above table, the delta should be between -1 and -0.5. So, for any option, identify its moneyness (ITM, OTM or ATM) ,and match it with the values as indicated in the above table. Also, think about the delta as a probability of the option to expire in the money. For example, if a call option has a delta of 0.4, then clearly from the table above we know that the option must be an OTM call option. The probability of this particular OTM call option to expire as ITM option by expiry is 40% (0.4*100). Similarly if the delta is 0.7, it means there is a 70% chance that this option will expire as ITM by expiry. Gamma is a slightly complicated greek. It is best understood with an example. Think about this situation – TCS is at 2,550, the strike under consideration is 2,650 Call option. Clearly the option is OTM. So the delta must be somewhere between 0 and 0.5. Let us assume the delta is 0.3. Assume, the stock moves, and TCS is now at 2,650. This also means the option has transitioned from OTM to ATM…which also means the delta has moved to 0.5 from 0.3. The illustration above clearly indicates one thing i.e the delta is a changing variable. The Gamma also referred to as the curvature of the option, gives us the rate at which the option’s delta changes as the underlying changes. The gamma is usually expressed in deltas gained or lost per one point change in the underlying. Unlike the delta, the gamma is always a positive number for both calls, and puts. Let us consider a Nifty example again. Assume Nifty is at 7,800, its delta is 0.5, and the gamma is 0.003. If Nifty moves by 30 points taking the spot to 7,830, the delta obviously changes. It changes by extent of 0.003 points for every 1 point move in underlying. So for a 30 point move, the 0.09 deltas are added upward. The calculation is as follows of the new delta is as follows.. The Vega of an option measures the rate of change of option’s premium with every percentage change in volatility. The vega helps us answer this question..”What is the likely change in the option premium because of a % change in volatility?” All options, irrespective of calls or puts gain value if the volatility increases. As volatility increase, the likelihood of the option expiring ITM increases. Therefore since options gain value with increase in volatility, the vega is a positive number, for both calls and puts. For example – If the premium of an option is 3.25 at 20% volatility, and the vega is 0.15. The premium increases to 3.40 when the volatility increases to 21%. Likewise the premium drops to 3.10 when the volatility decreases to 19%. All else equal, the ATM option will always tend to have a higher Vega compared to OTM and ITM options. This means to say that the ATM option is the most sensitive in total points to a change in volatility. As a corollary, the OTM option is always the most sensitive in percentage terms to a change in volatility. To illustrate – A call option at 15% volatility assumption, suppose ATM and OTM option is trading @ 2.00 and 0.50 respectively. If we raise the volatility to 20% the option might now trade @ 3.00 and 1.00 respectively. Notice, the ATM option has shown a greater point increase (1 vs 0.5) but percentage wise, OTM has shown a greater increase (50% vs 100%). You may have heard of stories about traders doubling their capital trading OTM options, well this is one of the reasons why they double! Options – Both calls and puts lose value as expiration approaches. The Theta or time decay factor is the rate at which an option loses value as time passes. In simpler words, it helps us answer this question – “How many points the option premium will erode for each day that passes by”. Therefore, the Theta is expressed in points lost per day when all other conditions remain the same. Time runs in one direction, hence theta is always a positive number, however to remind traders as it’s a loss in options value it is sometimes written as a negative number. For example, If an option is trading at 2.75 with theta of -0.5, all else equal the option should trade at 2.70 the following day. As we get closer to expiration, the rate at which option losses money accelerates, and therefore the premium. The erosion of premium is called ‘The Time Decay’. Due to the effect of time decay, options are considered to be a depreciating asset. 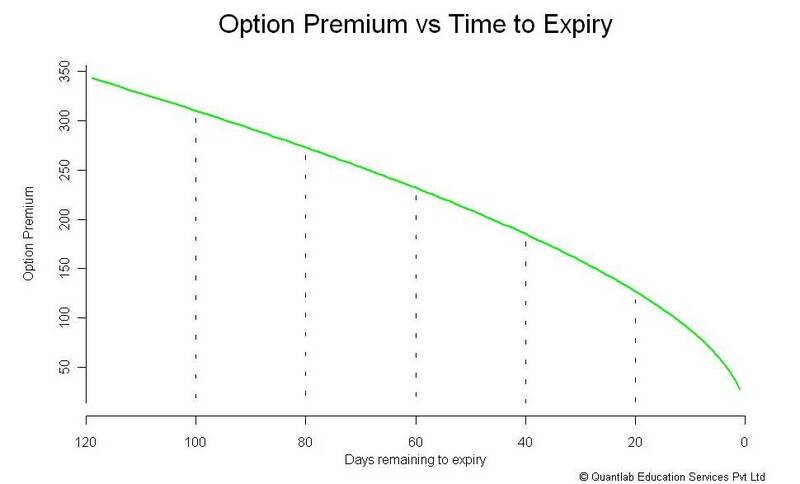 Here is a graph that shows how the option premium varies as time to expiry approaches closer. Notice how the drop accelerates in the last bit. This is why, it makes a lot of sense to write options as and when we approach expiry. For a long option theta will be negative – meaning every day that passes by, there is a minor loss in premium, which translates as a loss to the option buyer, hence the negative sign. Similarly when you write options, loss of premium because of the passage of time is good news. Hence the theta is associated with a positive sign for short options. The Vega of all option declines as expiration approaches. This also highlights an important principle while evaluating options…both time and volatility are closely interconnected! So the next time if you ever wonder why the premiums are not increasing in spite of an increased volatility, make sure you check the time to expiry! Now that you know what the ‘Option Greeks’ are all about, we need to figure out how to practically use these Greeks for making better trading decision. Identifying the best option strikes to trade considering the time to expiry is the key to successful option trading. Option Greeks helps the trader with just this. 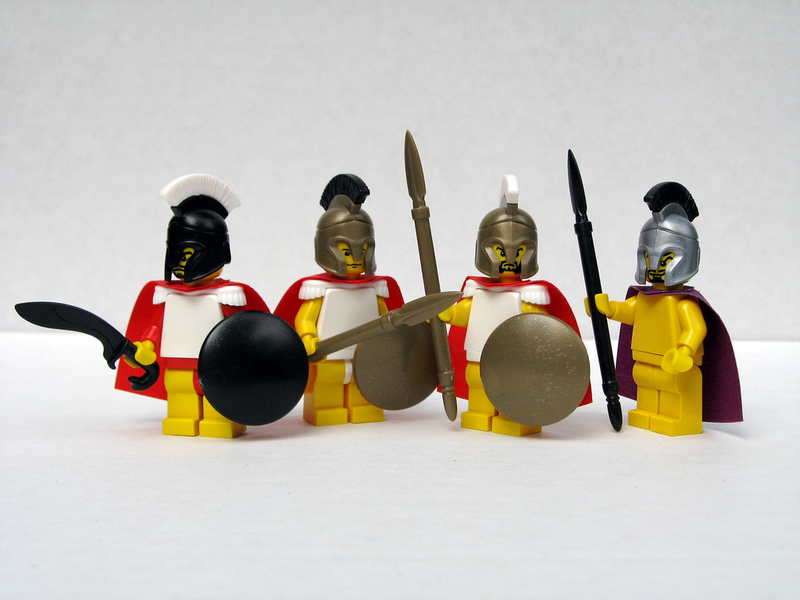 We will discuss the practical application of ‘The Option Greek’ in the next post. I'm of the belief that trading and investing is not a gift that you are born with but rather a skill that you can develop over time with practise and constant learning. At Zerodha, I'm focused on helping not just our clients but the community at large to understand the capital markets better and help them make better choices in the market. Very useful writeup. Thanks Karthik! Thanks for explaining about Greeks. I am a customer at Zerodha ,primarily involved in options trading. Please could anyone from Zerodha advIse , where to find/calculate the greek-option values of NIFTY index options ( different strikes). bas, we will shortly come up with another post which would explain how to use the options calculator. come back sooner with option calculator.. This is exactly what I was looking for. Detailed but simple to understand. Fantastic article Karthik! Thank you for the clear and concise explanation of Greeks. Two question/request: is there a tool to track volatility on individual stocks? when do you think options of VIX would be introduced? Thanks loke4300, hope the post was helpful to you. Thanks Karthik, Option greeks have always been a bouncer for me. Looking forward to you being able to simplify the application of greeks. Stay tuned Kamal, the next post will be on application of Greeks! Thanks Kartik really very good work. Wonderful article Karthik, Very Helpful.. Waiting for the article on application of Greeks, will we be notified when that article is published if we follow this thread? Thanks Sukesh, I’m glad you liked the post. Hopefully part 2 of Option Greeks should get published in the coming week. We will notify both on this thread, and on other social media channels. Request you to stay tuned. it is a great thing …. it is so informative… thanks. so first please conform, that thing is working in your platform. after that publish things in your site. if u cant follow things in your company …. please advice good broker other than you.? 1. You can view option Greeks on your Option Calculator. You can use Shift+O to open the Option Calculator and then calculate the Greek values for that particular option. This works on all versions of Zerodha Trader. Call our support line if you’re having problem viewing the Greeks on the calculator. The second option has been known to not work on some versions like 3.11.2, but an update should be able to fix this issue. Both the ways r not working…. 1;) first way— O/C window is showing but no calculation is happening,. 2) ii way — ztrader 3.11.2.1 ver become “spam” & the calculations are wrong. Binu, I guess there’s something wrong at your end if you’re unable to see the Greek values. They seem to appear on my system. 1. Check out the screenshot for the Option Calculator. It’s clearly showing you the necessary values when computed. You need to make sure you key in the volatility percentage and also the rate of interest. 2. Check out the screenshot for viewing Greeks on your MW. For this, you need to add the Greeks on your MW and perform the other steps I’ve instructed you to in the previous comment. If it’s still not functional we need to do some troubleshooting on your computer. Subclt…VIX can act as a proxy for volatility. For interest rates, please do look at the RBI 91 day t bill rates. It is 8.646% as of today. 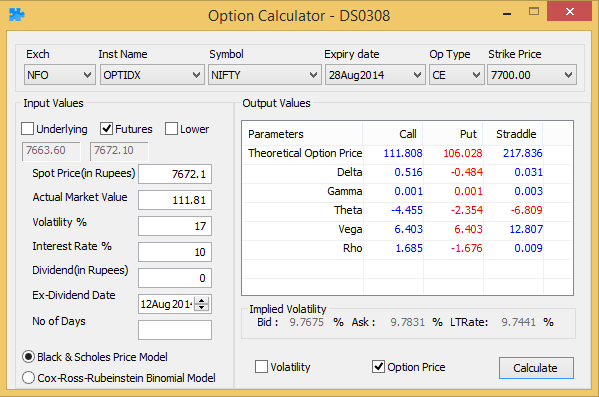 VIX August future showing today 1419 (LTP).But you placed volatility % is 17? please clarify.sorry to bother you again. Dear Sibclt, for volatility calculation, take the ViX spot, not its futures. Thank you for that write. Very useful and highly important for option traders. Do you also want to talk about Delta Neutral strategy and tools used for implementing it in your next article? Thanks Sudheer. I’d discuss delta neutrality, effects of vega, theta, and strike selection based on these variables. When you are planning to present your article about delta neutral hedging? I plan to finish the article over the coming long weekend :-)…also, I’d be talking about delta neutral positions, and really delta hedging. Probably that can be a different topic on its own. which is better choice out of these two, having less contract and more delta? or more contracts with less delta? We have discussed strike selection process, this may be of help. 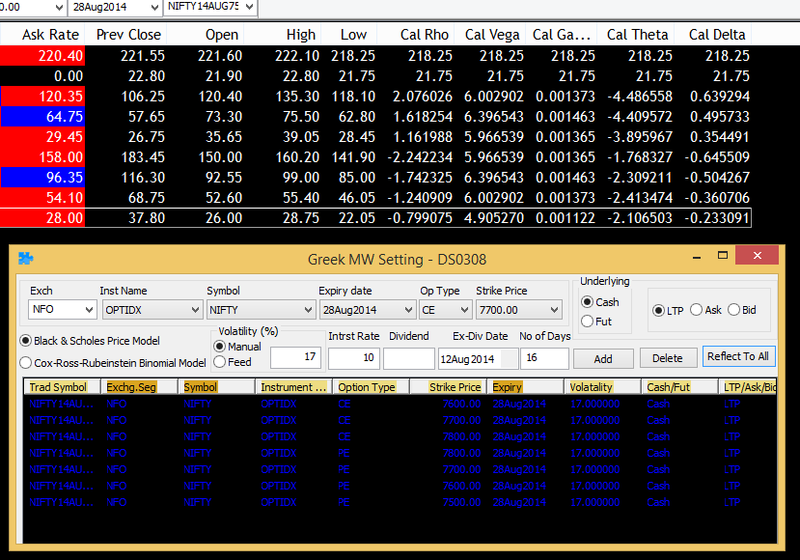 You are trying to trade a OTM option (1040CE) when we have just one more week to expiry. This is may not have a good impact on your P&L for reasons mentioned in this article. Do refer the theta section in the article. Instead I would suggest you trade the 1000 CE option as it has a better chance of being profitable (of course this is assuming your bullish call on Reliance is accurate). Also, While buying option in the 2nd half of the series do bear in mind that the effect of Theta will start to accelerate. Volumes always tend to be higher for a ATM option, hence 1000CE will have better volumes, and therefore better liquidity. Thank you Kartik for a nice explanation. Z-connect is a very cool place to learn. Appreciate all your efforts. I am Planning to initiate a strangle on nifty the future of it trading at 7983.70. I hv selected the strike CE 7950 (as this is nearest ATM) .The premiums are 124.50 (call) and 93 (put). Kindly let me know I am doing it right and if any advice it will be great help as this is my option strategy. Dear Anantha…considering market expires today it would be tricky to buy options. What is the procedure for selecting the stock for writing a covered call? Please do check this link on tradingqna.com for an explanation on covered call..
Hello sir, I am Ratul. I am about to open an account at Zerodha. Will be trading only in Nifty options. Just wanted to know how much liquid are the Indian stock options. If I trade in quality stock options like TCS, SBIN etc… is there much liquidity in these stock options to gain some profits out of them. or should I strictly stick to Nifty options only. The most liquid option contracts in India is – Nifty, SBIN, Reliance, Tata Steel, Tata Motors, and Infosys. You need not worry about liquidity as long as you trade in the near month contract in these scripts. Want to learn Option Greeks. Plz suggest any good course in India. zerodha.com/varsity/ already Learned and doing in a very little way. But i would like to do a professional option Greeks course , Delta neutralization. Because having a lot of doubt . Can u suggest from u r Experience . I want whole option chain is available on zoredha including greeks. Vomma is an 2nd order derivative of Vega Right! Excellent article ! We run a company where we our specialisation lies in Nifty options strategy which are delta neutral, positive theta but with very low gamma (meaning we do short options to generate monthly income but we protect those options with long positions thus reducing gamma and volatility risk). We would be interested to get in touch with you to see if some synergies could be realised . If you could share your email ID we can share past performance data as well as other information . Mandar, can you write to [email protected], please? It was an absolute bliss to read it, kartik..kudos..haven’t gone through an article on option Greek written this beautifully. This article is excellnt. Narration was so simple that can be understood easily..Thanks for such an useful blog…for option traders…please continue with such very related posts…thanks once again…god bless you..